FanFooty - #1 fantasy footy source for AFL Fantasy, Supercoach and Dream Team! 7.50pm AET Apr 26, Adelaide. 1.45pm AET Apr 27, Gold Coast. 4.35pm AET Apr 27, Docklands. 7.25pm AET Apr 27, SCG. 8.10pm AET Apr 27, Perth. 3.20pm AET Apr 28, Launceston. 4.40pm AET Apr 28, Kardinia. covering above sports plus NBA, NFL & MMA. 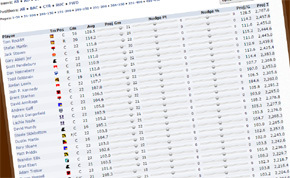 FanFooty brings you a new tool called FanDex, for creating and maintaining customised player rankings for your fantasy drafts. Default rankings are based on previous (non-vest) fantasy scores by each player, but you can “nudge” those averages up or down by moving sliders to increase what you think they will average in the upcoming season, either by points or by percentage, or both. In future, you will be able to export your rankings to formats accepted by major draft fantasy operators. Look out for a daily fantasy (DFS) version coming soon, where you can import your previous nudges from day to day or week to week. Back in the dark ages of fusty history – I’m talking 2011 here, several years after my last foray into the history books – the Australian fantasy industry was taking all before it. With more than 700,000 “coaches” in AFL competitions play-acting at managing their fake teams of real players in fake leagues using real statistics, and other sports adding up to push the local audience for fantasy sports past a million, in a nation of not much more than 20 million people it was looking like it would become as popular as it is in America. Then, something went wrong. The Mr Football fantasy management simulation is being developed by m0nty, and is currently in beta testing mode. Make your team and check out the latest rules document on the Mr Football board. holding out Josh P. Kennedy… who will be next? 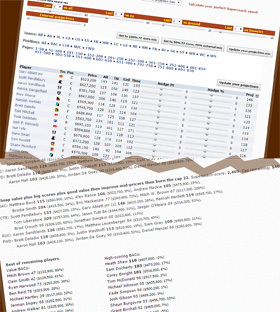 The FanFooty forums host a number of user-run fantasy games. There’s the XVs competition, which has divisions for Europe, Asia, Britain and World. A new addition is the XVIIIs competitions, which includes American XVIII Dreamteam and American XVIII Supercoach versions. Finally, the forumites are keen players of the From The Pavilion cricket simulation game, for which they have their own FTP board.